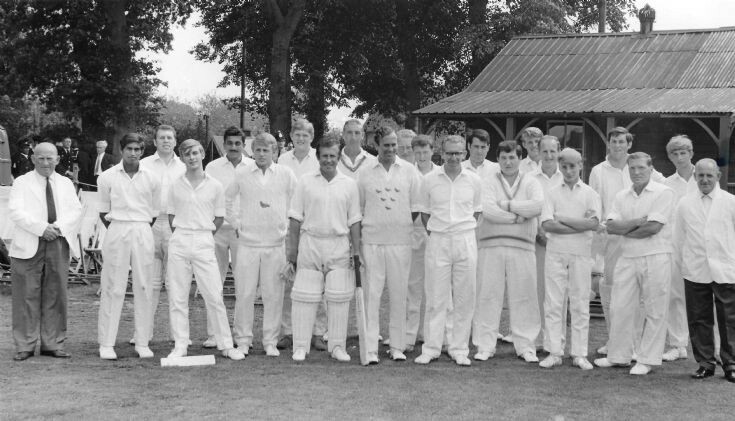 17th August 1969 was a momentous day for Handcross cricket club when they played host to a Sussex XI in the Recreation Ground. The event was to support benefit funds for two Sussex players, Les Lenham and Graham Cooper. The match, which was drawn, was generally played in a competitive but friendly manner although the only incident I can remember was when umpire, Bob Pattenden, gave a not out decision for an LBW appeal when John Snow was bowling. The bowler, who was some two feet taller, strode across to the umpire, grabbed his labels and lifted him off the ground! But it was all done in the best possible taste. The Large Version shows a numbered copy of the photograph to help identify the players and officials as follows. 1 Bob Pattenden (umpire), 2 Unknown, 3 Rex Ray, 4 Unknown, 5 Uday Joshi, 6 Unknown, 7 Unknown, 8 Ken Suttle, 9 Ron Johnson, 10 Les Lenham, 11 Ken Doggett, 12 Robin Wilkinson, 13 Jim Brown, 14 A. Besbrode, 15 J. Poulson, 16 Tony Buss, 17 Ted Underdown, 18 Graham Underdown, 19 Richard Langridge, 20 David Underdown, 21 Unknown, 22 Alan Pattenden (umpire). Please can anyone fill in some of the names? Sussex players, John Snow and Don Bates seem to be missing from the picture. Select Open Document to view the scorecard, which also includes some interesting details of the Player’s County League almost half a century ago. Second from the right (No. 21) is Paul Gardener. He had an older brother and they lived in Covert Mead. I do remember that John Snow arrived late. When Ken was facing Snow, poor old Ken was still playing his shot when the ball was in the keeper's gloves. He was quick!! On looking again, No. 4 is Paul's brother, Peter. Where is Peter Gardener now? Number 2 is Eknath Solkar, the Indian test cricketer! Next to Kenny Suttle is Alan Mansell.No 6. Behind Mansell and Suttle is John Spencer.No7. No 16 is Michael Buss.